Unless it's turned into coleslaw, I can't say cabbage is a very attractive vegetable to me. 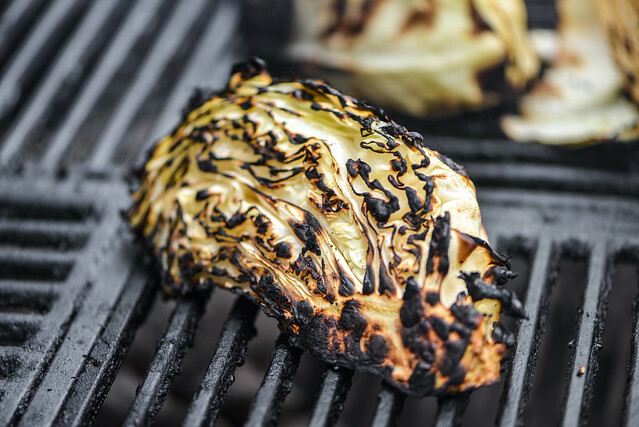 I've had it in the back of my mind to try grilling cabbage for years, but all the recipes I came across relied on roasting it, with or without a stuffing, until tender. I see little to no appeal in mushy, soft cabbage, so it never popped out at something I should make over anything else. Then over at Serious Eats, Kenji did a post on grilling cabbage that kept it tender-crisp, had an excellent char, and paired it with a number of dressings I could totally get behind. Instantly cabbage turned from something to actively avoid into a dish I needed to grill as soon as possible, which is exactly what I did. I can never quite just follow a recipe though—I need to feed my creativity, plus if it's an exact copy, it's no longer fodder for blogging. So I decided to use the process of grilling Kenji laid out, but devise my own dressing. For this I looked towards a Japanese influence, starting with a mild white miso base. That paste gave the dressing a strong, flavorful fermented start, but I built more around it by adding brown sugar, soy sauce, vinegar, mirin, ginger, garlic, sesame oil, red pepper flakes, and white pepper. The end result was an incredible salty, sweet, and spicy sauce that had that special umami character I knew would work wonders on the cabbage. Next I prepped my cabbage as I waited for the fire to fully light. 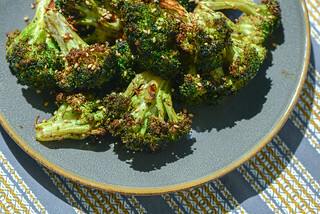 For grilling, butchering this brassica was quick and easy. I simply pulled off some of the dirty, darker green out leaves, then cut it up into six wedges. Since the root needs to stay intact to keep the leaves in place during grilling, it really is as simple as making six cuts and done. When my two-zone fire was ready, I then placed all of those wedges over direct high heat. They began charring pretty quickly—just around two minutes on the first side. I grilled each of the three sides until they developed attractive blackening around the edges of the leaves. Once they had that, they still needed some more cooking time to become tender enough for eating, so I moved them over to the cool side of the grill, covered, and let them cook until crisp-tender. This required an additional 4-5 minutes. At this point they looked as beautiful as I hoped and only got better after spooning on the sauce and garnishing with scallions and cilantro. My enthusiasm for trying this out was totally justified in the end—the cabbage was freaking incredible. 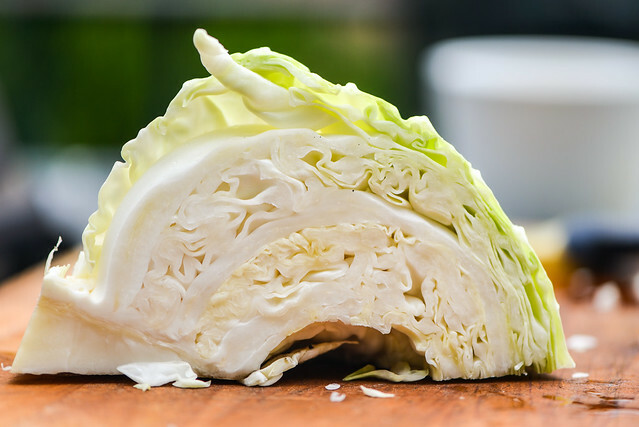 The contrast between the cabbage leaves' soft and crunchy spots was spot-on, and made even better by the fragile charred edges that had a light smoky flavor. 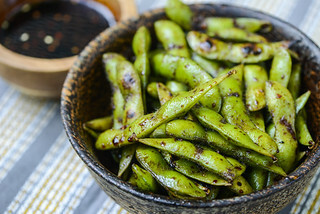 The dressing elevated it even more as it seeped between the leaves, making each bite a complex mixture of sweet, salty, earthy, and tangy. As I was eating it, I had a hard time fathoming that I was eating lowly cabbage...and that it was stealing the spotlight from the grilled meats I had alongside it, which is saying a lot. 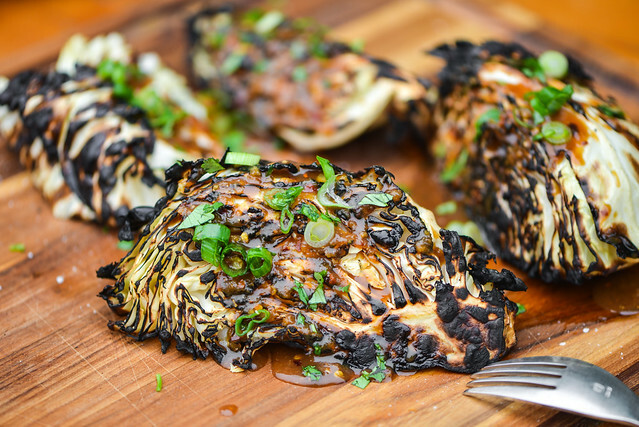 A contrast between soft and crisp, this grilled cabbage has a great texture and even better flavor thanks to a ginger-miso dressing that brings with a depth that encompasses sweet, salty, earthy, and tangy. 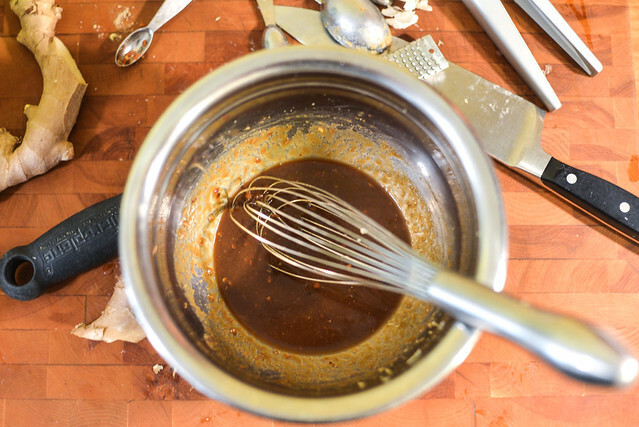 To make the dressing: In a small bowl, whisk together brown sugar, soy sauce, miso paste, vinegar, mirin, ginger, garlic, sesame oil, crushed red pepper, and white pepper. Set aside. Light one chimney full of charcoal. When all the charcoal is lit and covered with gray ash, pour out and arrange the coals on one side of the charcoal grate. Set cooking grate in place, cover grill and allow to preheat for 5 minutes. Clean and oil the grilling grate. 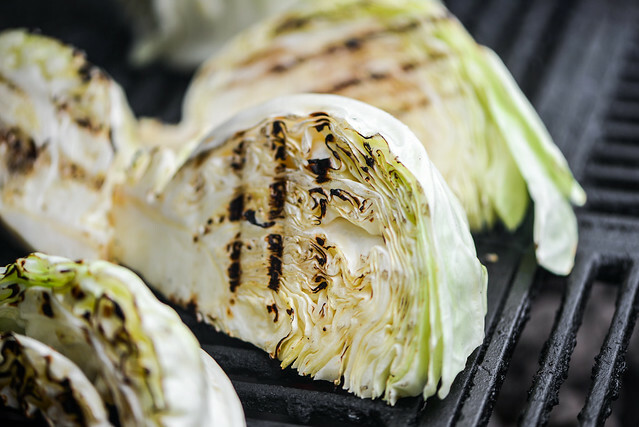 Place cabbage wedges on hot side of grill and cook, covered, until well charred on first side, about 2 minutes. Flip cabbage, cover, and cook until charred on second side, another 2 minutes. Flip wedges to third side, cover, and cook until well charred, another 2 minutes. Transfer cabbage to cooler side of grill, cover, and continue cooking until mostly tender but still crunchy in center, about 4 minutes longer. Transfer cabbage to a large bowl and toss with olive oil, salt, and pepper. Transfer to a serving platter. 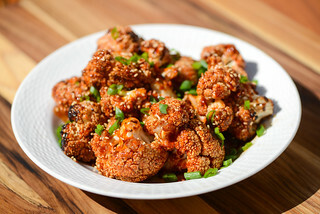 Drizzle with sauce, garnish with scallion, and serve immediately. I was checking on various ways of cooking cabbages, I come across this blog . 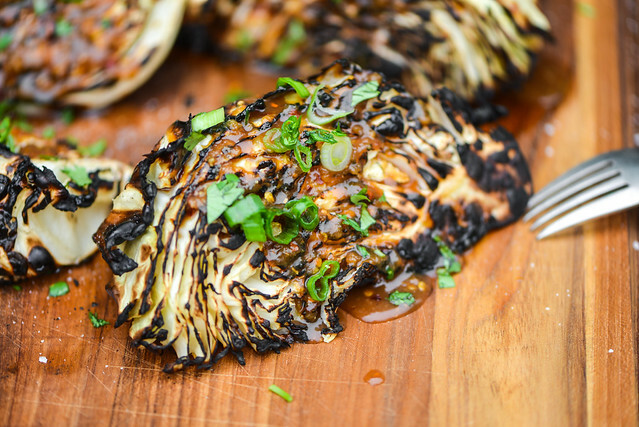 Grilled cabbage is so attractive.I will try it. This looks amazing. I'll definitely be trying. We regularly get cabbage in our CSA each week. I've always gone for more Eastern European type recipes. Excited to try this. With the coals evenly spread, there is no cool side.I'm going to assume (by instruction) that you want the coals piled on one side of the charcoal grate to create a two zone fire. Interesting grilling process which I'm going to try! I love this recipe, I will try to make this ASAP! I love cooking cabbages.this is just excessively delicious and I haven't ate yet so I'm formally kicking the bucket as of right now. It would appear that so much fun!Please stay us informed like this. Thank you for sharing. If i say only interesting then it will be wrong because i already followed your Grilled Cabbage with Ginger-Miso Dressing recipe and really it was so delicious. I like Cabbage but i did not try Grilled cabbage. After reading your recipes i am thinking i should try Because it looks like very tasty to me. This looks stunning. I'll certainly be attempting. We frequently get cabbage in our CSA every week. I've generally gone for more Eastern European sort formulas. Eager to attempt this. Really nice tips and am surely going to implement it on my blog once i get home and see if it will affect my rankings. Have bookmarked this page. This looks amazing.I love cooking cabbages.this is just excessively delicious.Very interesting too. Thank you for your sharing. Hope you keep sharing the more nice post like this. I never think, very good idea. Interesting grilling process which I'm going to try! Loving this recipe. Thank you for your sharing. Hope you keep sharing the more nice post like this.